time-variations is controlled with multiple business opportunities. Service Level Agreement (SLA), mutually agreed by both the parties (e.g., Goo et al., 2009). time resources and reducing the variation in the process. Wu, 2002). The matrix gives details like customer requirements, technical descriptors. based on projects and priorities. more data also the alerting system to predict the available capacity to hold the data. Liu et al. deterioration flow for aggregates and individual. forward the study of Design Service Level Agreements in Outsourcing Contracts. eliminate the gap between an outsourcing service vendor and the customer. and to identify the priorities, a tool such as House of priority (HoP) is adopted. RO3: To design an alarming method, that eliminates the non-value-added process. 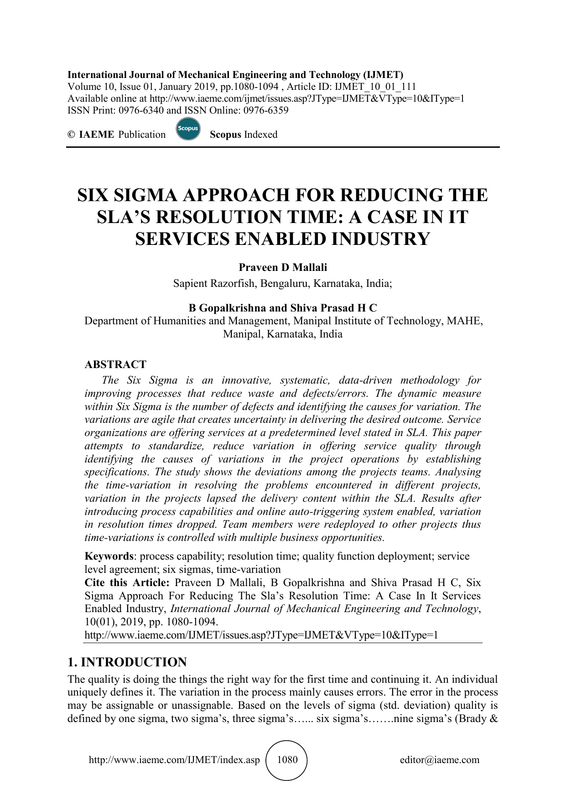 RO4: To maintain the uniform resolution time in the all project SLAs by deploying SixSigma methodology. of the issue and the type and the client importance; it will be assigned to one of the priorities. project scheduled are referenced to investigate further. information is given in detail so that it takes into the converging the process in the project. process capability indicators in the graph. considered as unable to meet the specification (www.isixsigma.com; Novaes et al., 2016). same priority. Hence, it is necessary to the specification limit for run all the projects. time frame concerning the service level agreement. reaching out of the specified limit is recorded and observed. 40% by the priority four which is the moderate priorities follow low prioritized issues. the natural variability of the process. deployment function tool is enabled, and it follows. critical needs and the priorities, the priorities are taken on the bases of customer requirements. the findings obtained at the bottom of the house of quality. pointers scale that highlights, number of errors that are occurring at a time in all the projects. value added to this research. more time consuming and thus the rationale for this research (Lawshe, 1975) (see Figure 4). results justified by the quality function deployment, pie chart, and Pareto analysis. designed to monitor the process. email to the respective technical team and to close the issue within the given time frame. tool/alert mail system added quality and productivity to work. a significant difference before and after implementing the alarming system. clear picture of the process variations (Figure 5). issues were sorted well within the resolution time as stated in SLA. where 75 tickets are in the bucket for three quarters. the issue that gives an average of 65 minutes approximately. all the projects (Project A, B, C, D) to SPSS tool as the independent t-test. process time cannot take non-negative quantity. and shortcut-action that needs to be fixed an alert system was initiated (El-Haik, 2005). last alert will be at 85% of time consumption (Figure 6). Tier1 level and resolve in high time by monitoring the alert emails. control, and they will monitor the real-time as per SLAs (Casola et al., 2016). a single location in Bangalore. Ahmad, M., & Abawajy, J. H. (2014). Service level agreements for the digital library. Management. Journal of Culture, Society and Development, 10(6), 21–24. edition), Dorling Kindersley Pvt. India. SLA-driven Methodology to Set-Up Security Capabilities on Top of Cloud Services. Systems (CISIS), held on 6–8 July 2016, held at Fukuoka, Japan, 549–554. Systems & Services: International Digital Library Perspectives, 24(2), 87–90. (ICACT), held on 21–23 Feb. 2005, at Phoenix Park, South Korea 1,697–700. manufacturing environments. Total Quality Management,15(5-6), 699–706. Support Systems VI - Addressing Sustainability and Societal Challenges. ICDSST 2016. Lecture Notes in Business Information Processing: Springer, Cham, 250,137–151. Novaes, A. G. N., Lima Jr, O. F., Carvalho, C. C. D., & Aragão Junior, D. P. (2016). School Publishing: Boston, MA, USA. Sigma: a literature review. International Journal of Lean Six Sigma, 1(3), 216–233.